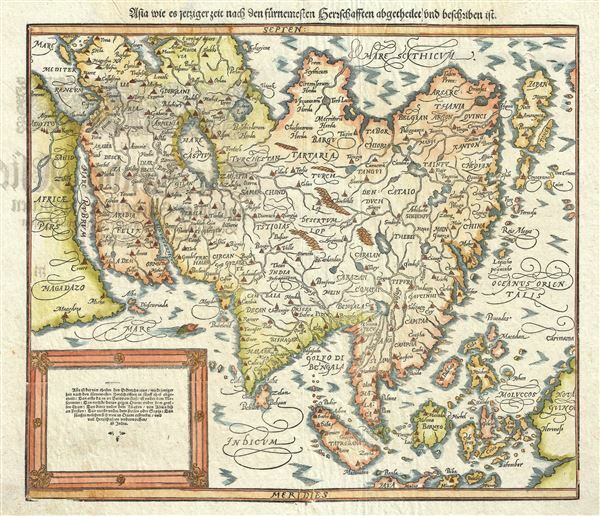 This is what is generally considered the second Munster map of Asia, published by Henrich Petri in 1588. Following the model established by Ortelisu's 1567 Asiae Nova Descriptio this map covers from the Mediterranean to Japan and from the Arctic to Java. Relife is renedered in profile and numerous towns and cities are noted. Sumatra is identified as Taprobana. Japan appears in its kite-form and is based upon Jesuit sources. The great rivers of Southeast Asia, the Mekong, Chao Phraya, Irrawaddy, and Brahmaputra, are drawn as originating from a large lake in the mountains of what is today northern Thailand - no doubt a precursor of the apocryphal lake of Chiamay. The islands of east Indies, collectively identified here as the 'Moluccos,' are vaguely rendered but recognizable. This 1588 map was engraved in woodcut and published in Basel by Sebastian Petri. After 1588, this map was only re-published in posthumous German editions of Sebastian Munster's Cosmographia issued in 1592, 1598, 1614, and 1628, and is thus rare. Munster, S., Cosmographica, (Sebastain Petri, Basel) 1588. The Cosmographia was first issued by Sebastian Munster (1488 � 1552) in 1544. It is considered the earliest German description of the world. In order to produce the Cosmographia Munster put out a call to scholars throughout Germany for cartographic information. The response must have been impressive, especially with regard to far off destinations, for it enabled Munster to compile a work of unprecedented scope and accuracy. The volume proved to be one of the most popular and enduring volumes of the 16th century, appearing in some 24 editions over the next 100 years. The Cosmographia typically consisted of six volumes, each dedicated to a different part of the world. The final edition was issued in 1628, long after Munster himself had passed on. Very good. Minor centerfold wear. Pinhole in bottom margin, well away from printed area. Minor repair upper right margin, well away from printed area. German text on verso.